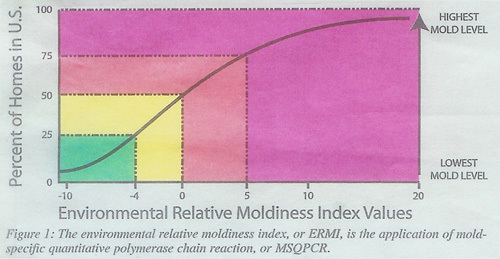 The Environmental Relative Moldiness Index (ERMI) and the American Relative Moldiness Index (ARMI) was developed by Dr. Steve Vesper and the United States Environmental Protection Agency. It was developed by scientists at the USEPA to provide a straightforward, objective and standardized way to obtain results for indoor air quality investigations. The EPA is developing am ERMI ranking system based on dust samples collected from homes across the United States. 36 different fungi make up the ERMI and are designated as Group I (those found in atypical, water damaged homes) and Group II (those commonly found in all homes). If a person is not feeling well and his or her doctor has determined that sensitivity to mold is an issue to explore, than the ERMI analysis of the patent’s home is a good place to start. An ERMI analysis might help you to determine if your home is safe for visitors who might have genetic susceptibility to mold.